Poachers have entered one of Africa’s most unique elephant habitats on Monday, threatening to cause one of the biggest elephant massacres in the region since poachers killed at least 300 elephants for their ivory in Cameroon’s Bouba N’Djida National Park in February 2012. 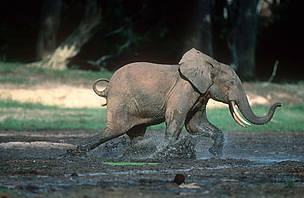 According to WWF sources, a group of 17 armed individuals on Monday entered the Dzanga-Ndoki National Park and headed for the Dzanga Bai, locally known as the “village of elephants”, a large clearing where between 50 and 200 elephants congregate every day to drink mineral salts present in the sands. Two WWF-supported local researchers said that three members of this group armed with Kalashnikov rifles approached them in the forest on Monday, asking for food and directions to the viewing tower at the Dzanga Bai, which is used by scientists and tourists to observe elephants. After giving a false lead, these sources immediately ran away and heard gunshots coming from the Bai on their way into hiding. Also on Monday, two ecoguards said they saw they saw armed individuals on the Dzanga Bai observation platform shooting in the direction of elephants. While going into hiding, these sources said they saw the vehicle which had transported the 17 gunmen parked at the entrance of the park. WWF calls on the international community to help restore peace and order in the Central African Republic, which has been rocked by violence and chaos since the beginning of the year, and to help preserve this unique World Heritage Site. “Unless swift and decisive action is taken, it appears highly likely that poachers will take advantage of the chaos and instability of the country to slaughter the elephants living in this unique World Heritage Site. “Wildlife crime is not only a consequence of instability, but a cause. It fuels violence in the region, in a vicious circle that undermines the stability of these countries and their economic development..
“Central African Republic has to immediately follow through on its promise of two weeks ago to mobilise troops to end poaching in the region. WWF also calls on the international community to immediately provide assistance to Central African Republic in restoring peace and order in the country, and to preserve its unique natural heritage. “We also urge Cameroon and Republic of Congo to provide support to the Central African Republic in preserving this World Heritage Site, which not only encompasses the Bai, but also includes large neighbouring areas of these two countries. Please provide Andrea Turkalo’s email address so I could run by her an idea about how to combat the ivory trade.